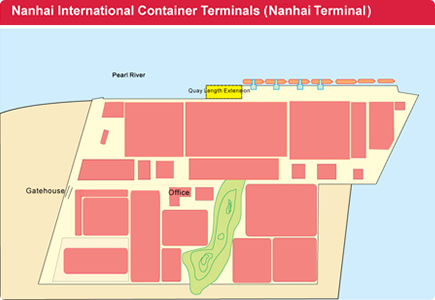 Nanhai International Container Terminals ("Nanhai Terminal") commenced operations in 1994. It is located in the Sanshan Port Economic Development Zone, which is in the Nanhai Area of Foshan City, Guangdong Province. 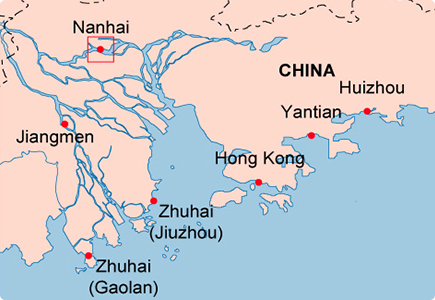 The terminal lies on the north bank of the Xijiang River, 84 nautical miles from Hong Kong. Nanhai Terminal offers a 5,000-square-metre off-dock refrigerated warehouse. Other features include import bonded and export surveillance warehouse facilities, local vessel and cargo agencies, as well as container repairing. On-site customs, joint inspection services, and X-ray container inspection services are also provided within the terminal. Nanhai Terminal provides regular feeder services to Hong Kong, Shenzhen and Nansha.